Fourteen hundred attendees stream into the Champlain Valley Exposition in Essex Junction, VT. The air carries the spirited atmosphere of a hockey arena. It’s a frigid, February Saturday morning, with no helmets or skates in sight. 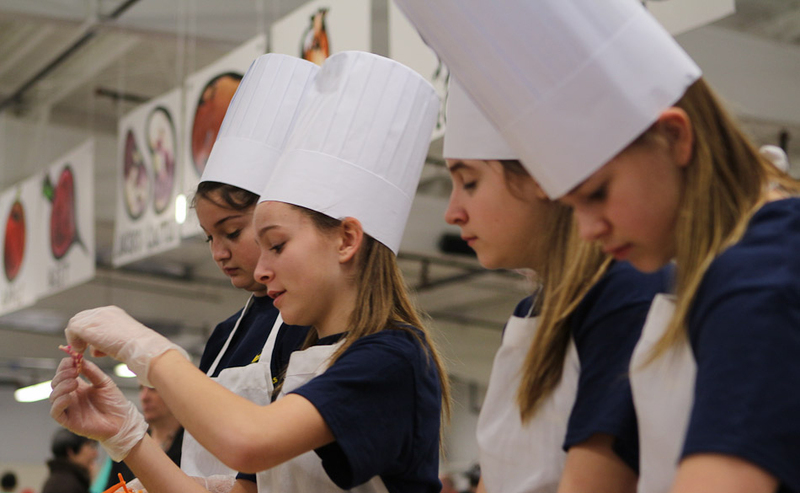 Seventy-four middle and high school teams from 55 schools across Vermont don chef’s hats and colorful uniforms and await their signal to begin cooking. Ready, set, chop! Carrots are launched into food processors, rutabagas cubed on cutting boards, and parsnips ready to become soup. 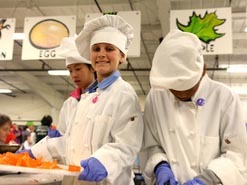 It’s the Sixth Annual Junior Iron Chef Vermont, a name chosen with explicit – and well-earned – permission from Iron Chef. Its hosts are Vermont FEED (Farm to School Education Every Day) – a partnership between the Northeast Organic Farming Association of Vermont (NOFA-VT), Food Works at Two Rivers Center, and Shelburne Farms – and the Burlington School Food Project. The rules of Junior Iron Chef Vermont are simple. Supported with hands-off guidance from coaches (i.e., a local chef, food service director, or teacher), teams of up to five students have 90 minutes to prepare from scratch a delicious, beautifully presented original recipe that showcases Vermont flavors and may be replicable in school cafeterias. Each team must incorporate into their dish at least five local vegetables that are supplied by Junior Iron Chef. Microwaves, hot plates, and pre-prepared foods have no place here. Immersion blenders, whisks, and wooden spoons fly. Best in Show and Lively Local award winning team recipes will be featured on their school lunch menus, as well as at the Vermont Statehouse. Funds generated by the competition go towards Vermont farm to school programs, empowering students to learn about and take action around such food system complexities as lack of access to fresh fruits and vegetables in school meal programs. 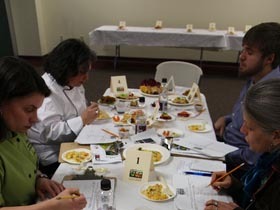 Under the auspices of Mark Molinaro of the New England Culinary Institute, Junior Iron Chef’s 25 judges include Ellen Ecker Ogden, author of The Complete Kitchen Garden; Joey Donovan of the Vermont House of Representatives; and Ric Cengeri of Vermont Public Radio. But no one needs to be an expert to know that the quality of cooking and creativity exhibited by the middle and high schoolers is high. Green Pepper and Egg Empanadas, White River Chapattis with Vermont Curry, Yellow Jacket Ratatouille in a Polenta Bowl, and Roots Cellar Ravioli are just a sampling of the many remarkable dishes that came off table-top gas stoves at the Expo. And beyond taste and presentation, the event’s positive impact ripples. I’ve always found that people start to see food in a different way when they begin to cook. They begin to grasp the essence of the ingredients – health, flavor, and function – and begin to make the connections between farm and table. This ‘food literacy’ is the best way to get people to naturally make smart food choices, and there were hundreds of kids in that hall on Saturday whose food literacy has gone way up because of Junior Iron Chef. The last time I saw Rowan, he was Master of Ceremonies of the Chefs Collaborative National Sustainable Food Summit, a conference that brings together chefs and food professionals around the country to create a more sustainable foodscape through education and responsible buying decisions. Seeing Rowan on the West Coast just a few months before, surrounded by farm to table (e.g., fine dining) and farm to institution (e.g., corporate, museum) rather than farm to school (e.g., K-12) chefs reminded me that it takes a collaborative community to revitalize our nation’s school lunch programs and food economies. It is the diversity of Vermont’s Junior Iron Chef participants and good food advocates – from policymakers to small business owners to artists, public to private to home-schooled youth, friends to siblings to parents and grandparents of budding chefs – that is fueling Vermont’s leadership in creating greater access to healthy, local, sustainable, and equitably produced real food in schools. Better yet, Junior Iron Chef represents just a slice of the perspectives, talent, and excitement increasing across the country towards building a better food system for our children. Junior Iron Chef’s six-year presence has already been influential. In Vermont, more than double the number participated this year than in 2008. Since its Vermont founding, Junior Iron Chef has been duplicated other states, including competitions in Kansas, Michigan, and New York. Today, there are over 100 farm to school programs in Vermont, and over 8,900 farm to school projects nationally in 42 states. To view the winners and results, click here.